A buccaneer who has spent the last fifty years at sea and only days at a time on land, Peyrol (Zorba the Greek's Anthony Quinn) maneuvers his crew past the British battleship of Captain Vincent (Dial M for Murder's Anthony Dawson) and sails the Marigalante into the harbor of Toulon to secure an agreed-upon pardon of his men should he return with a captured British vessel. The Captain of the Port (Il Sorpasso's John Francis Lane) and Citizen Dussard (La Dolce Vita's Mino Doro) – whose duty it is to assess the "political reliability" of all who enter the port – are reluctant to believe that a buccaneer could maneuver a captured ship from the Cape of Good Hope past the blockade of British battleships without cooperation with the enemy even though Peyrol carries a packet of papers meant for the chief admiral (Murder Mansion's Franco Fantasia) which surely would have been confiscated by the British. Dussard orders Peyrol and his men to remain in Toulon until further notice. Peyrol, on the other hand, plots to get onto another ship and set sail again but finds his crew and even his loyal first mate (Giulio Marchetti) are all homesick and world-weary. When Doussard confronts Peyrol with British coins spent by one of his men, accusing him of theft of gold from the ship – an offense punishable by death – but offers to look the other way for a share, Peyrol escapes and makes his way to the coast and the village he left forty years ago. Finding only the graves of his family, along with lame outcast Michel (Death Walks at Midnight's Luciano Rossi), Peyrol plans to move on after finding a bed for the night until he must intervene in the villagers' torment of seeming madwoman Arlette (The Killer Reserved Nine Seas' Rosanna Schiaffino). Once the daughter of the coastal town's wealthy farming family whose land was overrun and burned down during the French Revolution, Arlette now lives in the hilltop farm belonging to her aunt Catherine (The Lady from Shanghai's Rita Hayworth). Against Catherine's concerns for the childlike Arlette's attraction to Peyrol, and the suspicions of former farm steward Scevola (Black Sunday's Ivo Garrani) – who holds over them his ability to protect the women from the villagers while taking other liberties with them – Arlette insists that Peyrol stay as their guest. Peyrol buys an old boat off of Scevola with plans to restore it and cast off to sea in a few weeks – securing the help of locals after stepping in to defend a man accused of theft from one of the self-important "Citizens" – finding obstacles not only in the British ship on the horizon but in Arlette's attachment to him (having seemingly recovered after being forced to face the blocked trauma of her childhood). When Lieutenant George Real (The Haunting's Richard Johnson) arrives, ostensibly to survey the coast, he too becomes infatuated with Arlette; however, he reveals his true purpose to Peyrol and the nature of the buccaneer's original mission. Just as Real offers Peyrol the choice between a British prison or a French guillotine, Real also faces a quandary between duty to his country and his love for Arlette. 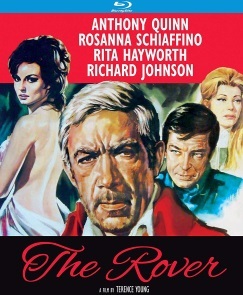 Based on the final novel by Joseph Conrad – as scripted by Luciano Vincenzoni (A Quiet Place in the Country) with some input (presumably rewriting the English dialogue) by director Terence Young's regular collaborator Jo Eisinger (The Jigsaw Man) – The Rover has bookending seafaring action sequences but is really a look at the regrets of a life spent with "no minute unused. No day unlived," as the advertising reads. "You can't take year and put them away in a chest for use later," says Catherine to Peyrol when they weigh the number of years he has left against Arlette's youth. The questionable nature of a relationship with a "childlike" woman by two older men is apparently resolved by Arlette being forced to face the childhood trauma she blocked from memory, after which she starts to behave like an adult woman, although presumably her development is not supposed to be all that arrested compared to any other sheltered, unmarried young woman of the time period (the harsh realities for outcasts in the aftermath of the French Revolution notwithstanding). The film really belongs to Quinn and his character, with Schiaffino given a showy but underdeveloped role while Hayworth manages to invest her even more underwritten role with substance and pathos. Johnson's romantic co-lead is as functional role as Dawson's British rival to Quinn's "Old Fox." Production values are high with the Technicolor photography of Leonida Barboni (After the Fox) giving this Italian production more the feel of a British production of the period and Ennio Morricone (Nightmare Castle) providing one of his more lyrically romantic scores without the instrumental experimentation of his concurrent Spaghetti Western or later jazz and rock-tinged giallo scores. Producer Alfredo Bini backed the earlier films of Pier Paolo Pasolini before Alberto Grimaldi took over, while American executive producer Selig J. Seligman was just moving up from TV (General Hospital and Combat!) to international co-productions ranging from the likes of Candy to Hell in the Pacific. Released theatrically stateside by Cinerama Releasing and then to television, The Rover has long been unavailable on home video – apart from an HD-remastered French DVD that is not English-friendly and a Spanish DVD with English audio that may not be authorized – The Rover comes to Blu-ray in a 1080p24 MPEG-4 AVC 1.66:1 widescreen transfer that looks somewhat inconsistent. The Technicolor photography boasts gorgeous colors with rich red and blues of French uniforms that also evince believably worn textures and the moody lighting is full of glamor shots of Schiaffino, but certain shots look coarser and others softer than the surrounding footage (which might be a mix of location long and wide shots and close-ups shot in more controlled conditions) but it generally looks quite nice in motion in the studio scenes (including the large courtyard set). One wonders how it compares to the European HD master which presumably comes from a source closer in generation to the camera negative if not that. A running time has been reported in references but not confirmed of 103 minutes, but the Blu-ray runs just short of 98 minutes which may be indicative of trims or not. The sole audio option is a DTS-HD Master Audio 2.0 mono track in which post-synched dialogue comes through clearly - Quinn, Schiaffino, Hayworth, Johnson, and Dawson appear to loop their own dialogue - and Morricone's score sound rich without distortion. There are no subtitles or captions. The sole extra – apart from trailers for other Kino releases – is an audio commentary by film historians Lee Gambin and Dr. Eloise Ross which seems to go off subject early on as they discuss the tropes of Bram Stoker's Dracula but they do so in conveying the way in which the atmosphere of the coastal village with its seemingly superstitious villagers – Arlette's tormenters call her and her aunt "drinkers of blood" as the local stand-ins for the ruling elite – as encountered by weary traveler Peyrol (also comparing Michel to Renfield, although this is one of the few films in which actor Rossi is not playing a pervert or psychopath). The discussion soon moves to Quinn's hopes for the film and his career move from character actor and heavy to Latin lover, Hayworth's latter day credits – there are some parallels to the French thriller Road to Salina – director Young's career outside the early Bond films, and other Conrad adaptations.